It’s the third Saturday in October and you know what that means-the Tide and the Vols. Although Bama has dominated this rivalry of late, there is still something special about this game. Maybe it’s the time of year or the changing of the leaves or the hate, but this game is still important to both Tide and Volunteer fans. The Tide of course comes in undefeated after winning in the rain at Missouri running for almost 400 yards against the Tigers. That’s not good news for a Volunteer defense that gives up over 30 points a game including giving up 41 points to Mississippi State in a loss. 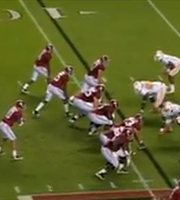 The Bama defense on the other hand gives up just over seven points a game. Not good news for quarterback Tyler Bray who has struggled at times this season. Tennessee’s best shot to win this game is if Bray plays like he can and so far he has not done that consistently this season. What makes things worse is their leading rusher may not play either. Keep in mind though, that in last year’s game, the Vols played Bama close in the first half until they turned on the jets and pulled away. I wouldn’t be surprised if the Vols did the same thing this year with the same results.